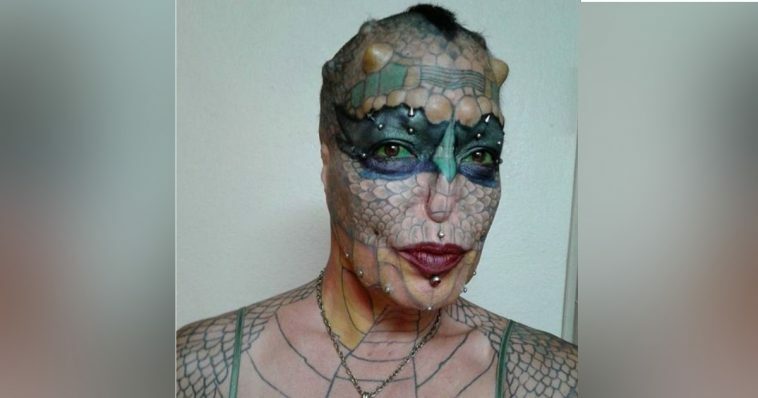 A woman named Eva Tiamat Medusa has spent in excess of 40,000 pounds due to her desire to turn herself into a reptile. Her dream is to live like a dragon. Eva—who is from Bruni, Texas—is referring to herself as the world’s most modified transgendered person. She quit her job as the vice-president of a bank many years ago; the first part of her transformation involved getting her nose-reshaped—as well as her ears removed. The whites of Eva’s eyes were stained green. Eva was abandoned by her parents at the tender age of five. According to her, a western diamondback rattlesnake would end up taking her under its wing; that is when, she says, she was “born again”. She realized that she wanted to morph into a reptile. While living as a man, Eva was diagnosed with HIV. Eva became committed to the idea that she would not die as a human. Eva has said that her transformation is the greatest journey of her life. There are “deep meanings” and “profound reasons” about her transformation, which is why she is doing it. Eva said she has two mothers. The first mother is the one who originally gave birth to her. Her second birth was to her reptilian parents—the rattlesnakes. She also said that her “big thing” is that she does not want to die looking like a human being. She acknowledged that there is “goodness” and “awesomeness” in humans, but added that humans are destructive and hateful compared to most species. She decided it was time for a change in her life, and wanted to look like a creature that wasn’t human. Eva, who is now known as “The Dragon Lady”, has eight horns on her forehead. Her whole face is tattooed, and her tongue is bifurcated. Eva now describes herself as trans-species; she does not identify as a human. Instead, she considers herself a reptile. One of the chief reasons Eva is talking about her experiences is that she wants others who might want to change their bodies to feel less alone. She would like there to be an open dialogue regarding body modification. She would also like other people to understand what it was like to live for 53 years as a gay man—and then as a transsexual woman. Eva said there is a lot of misunderstanding out there regarding what it means to be transsexual. There is also misunderstanding regarding the idea she introducing, which is trans-speciesism. She has stated that she no longer considers herself just a human; she’s human and reptilian. She claims that her greatest desire is to continue modifying her body until the metamorphosis is completed. That desire—she says—is what drives her. It is the reason that she gets up every day and lives. She is hoping that her story will help others—those who have gone through difficult times and also those who have lost hope. Happily, Eva does seem to be enjoying her life. Eva’s case is a pretty extreme example of body modification, but body modification isn’t at all an uncommon practice. In fact, it could be argued that commonplace things—like ear piercings—are actually examples of body modification. Other relatively common examples include tattoos, feet binding, teeth blackening, cosmetic surgery, and corsetry. There is actually an organization known as the Church of Body Modification. It is a non-theistic religion with over 3,000 members in the United States. Members of the church use body modification to “experience the divine” as well as strengthen the bond between the mind, soul, and body. They believe that body modification is one of the safest ways to stay spiritually healthy. The church does not actually have a physical location; according to the website, members may worship in their homes, studios, or parks. Members are not required to donate to the church, and they are not required to attend any events or rituals. There are online classes on the third Sunday of every month. The church may sound like something of a joke, but it is actually recognized by the United States’ Federal Government and is even considered a non-profit entity by the US Internal Revenue Service. 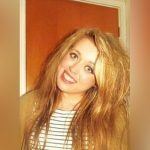 On the website, the church makes it clear that it cannot protect its members from being fired for visual discrimination.